It was a busy day yesterday for the Department of Education. Officials launched the 2016 National Education Technology Plan (NETP) at White House ceremonies in Washington, D.C. during the same week that Congress passed the Every Student Succeeds Act (ESSA), which replaces No Child Left Behind. Tech & Learning was there for the festivities. Reporters first had the opportunity to meet with superintendents who are involved with the DOE’s Future Ready program, which was initiated the year before. Darryl Adams of Coachella Valley Unified School District (at left with Bridget O'Connell) in California discussed how they wired school buses with Internet hubs to provide mobile community conections. Bridget O’Connell of Palisades School District of Pennsylvania talked about how her schools integrate MOOCs to offer more courses and experts to their rural students. Karen Sullivan of Illinois’s Indian Prairie discussed how they brought her disparate district of 28,500 to 1:1. And Baltimore County’s Dallas Dance explained his district’s partnership with Comcast to use bandwidth redistribution strategies in order to get his large urban district connected. 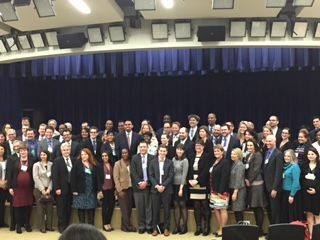 Most of these Future Ready leaders agreed: equity and connectivity were keys to the success of both the National Edtech Plan and ESSA. How does this differ from the 2010 Edtech Plan? Richard Culatta (at left), in his last speech as Director of the DOE’s Office of Technology, explained that this new plan would be a “living document” that would be online rather than printed on “a bunch of dead trees.” This change makes the Plan easier to search, and easier to update as technology and school needs change. He said the goals of this new plan would broaden the scope from just K-12 to include higher ed, preschool, and adult education. He went on to detail how the new plan complemented the goals of ESSA and, more specifically, the ITECH component of this bill, which focuses on spending funds on professional development (85%) rather than devices (15%). Technology equity is a core goal of the plan. The event also celebrated the one-year anniversary of the Future Ready initiative with the launch of a new Future Ready website from the Alliance for Excellent Education that features a one-stop resource center for ongoing professional learning opportunities including partner events, workshops, online chats, mentoring, and topic conversations, all aligned to the Future Ready Framework. The Department announced five regional Future Ready summits in 2016 in Austin, Boston, Madison, Seattle, and Tampa (dates TBA). The summits are open to district leadership teams from districts where the superintendent has signed the Future Ready District Pledge. It is not often that D.C. witnesses this kind of bipartisan synergy: the ESSA passed easily in the House and Senate, the National Edtech Plan was approved including the ITECH component, the president’s ConnectEd program expanded its goals to get everyone connected, and the Future Ready program outlined many ambitious new programs—all in a presidential election year. This will be an interesting year.